Harnessing complex aerodynamics to heat and style your hair in myriad ways, the Airwrap is an incredibly impressive device, if you can learn to use it. ▶ Videos for "Dyson Airwrap"
An look at how the Dyson Airwrap was engineered using the Coanda. 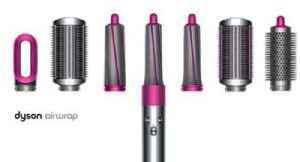 Dyson Airwrap Styler - How To Curl Your Hair In Minutes! Our resident junket goer, Reta, has a lot of important events to go to. How does she always keep her amazing curls so intact and pristine? Today, we discover her secret, the Dyson Airwrap Styler.